My friend’s eleven year old son, Dwayne, taught a science class last week in his one room school house. The teacher had started a lesson on bees when Dwayne raised his hand and asked if he could teach the subject. She agreed. He started to explain bees and pollen when suddenly he ran outside. He came back with a bee in a bottle. He proceeded to show the class of first to six graders the pollen on the bees little legs and then explained the process of pollination. When he concluded, the teacher exclaimed that he taught the subject better than she could have done. One room schools are interesting. I mentioned to a young couple at a dinner that I was intrigued by them and wondered if we could carry the idea of them over into regular schools. 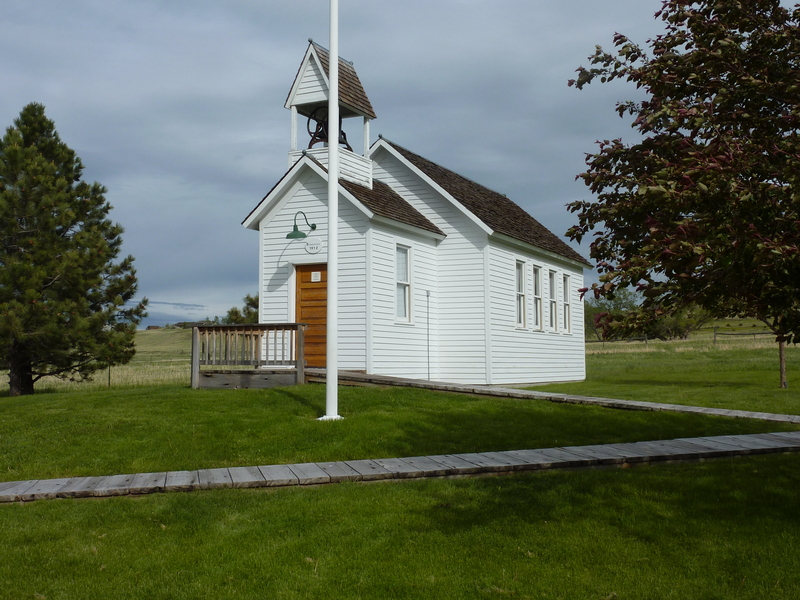 The mother of a nine year old girl said that in the small town in Wyoming from where they came the one room school experience had been great academically for her daughter, but bad socially. The school had 7 students; six were girls and one boy. The five other girls turned out to be Heathers i.e. mean girls. So the little girl was miserable there and is much happier now in their new town in a school with lots of kids. The mother and father had a unique explanation for the bad behavior. Except for their daughter, all the kids lived in town and not on ranches even if their parents owned ranches. They didn’t do chores before school like their daughter did. They felt that had something to do with the mean girls’ nasty behavior. Maybe, I thought. Maybe not. Perhaps there was a way of combining all these variations. Why divide learning up by age to begin with? I mean a kid born in January ends up in the same class as the kid born 12 months later in December. When I was young there was a school that had half year classes in an attempt to figure that one out. Combining the one room school idea but in a larger context might work. Structure or destructure a school like Pixar Studios with the bathrooms and common space in the middle of the building, so kids can mingle. Also having everybody do animal and plant chores during the day is good for all kinds of things. Also in the one room school model, the older children are enlisted to help the younger ones with studies they have mastered. So the teacher gets help and the older children learn the art of teaching. Always seemed to me that if you could learn to be a good teacher, you would be prepared for almost anything. And it might replace the meanness for attention with genuine sharing of accomplishment and nurturing of the younger ones. I’m sure none of these ideas are new. Utopian schools like the Ferrer Schools in Spain, Summerhill, and Beacon Hill Schools were experiments in giving children the freedom they did not have in most schools. They came from a view that learning should be voluntary and free. It is part of the pursuit of happiness rather than a preparation for life as a drone. Not much is really new. But maybe it’s time to do another reboot and take a look at what “school” should look like. Instead of looking at education as a “race” or school as a place for indoctrination into the myths of a nation, we should all be going in the opposite direction. Childhood and maybe even a good deal of adulthood should be a time to stop and smell the roses and the alfalfa. Fun Facts: Did you know that in Switzerland, you only have to go or “visit” school for 9 years which consists of 6 years of primary school and 3 more years of either a job training program or the college prep type school. Most students who choose the college prep school go 6 years. The students who choose job training go 3 years and then start work. There is no national education department. The way schools are structured are determined at the canton or municipal level. (Wikipedia). Gatto also makes the observation that in science fiction the future or the end of history is peopled by robots not by slaves. I keep coming back to Steven Van Zandt’s character, Frankie Tagliano in the Netflix TV series “Lilyhammer.” His nickname is “The Fixer”. J.J. Abrams TV series “Person of Interest” (CBS Thursdays) also has “a fixer”; an armed and dangerous guardian angel played by Jim Caviezel. These guys are the opposites of what we call managers. Both of them encounter huge public bureaucracies with rules and regulations and they choose to help somebody in trouble by breaking those rules; going around authority. They don’t seek to control or manipulate the situation or keep it calm. They fix it. Okay, and I should add they are very good at cracking heads and are crack shots to boot.